What is the significance behind Moorcroft signatures and marks? The very first Moorcroft Florian ware marks originate from 1897 and have a standard brown Florian ware mark as well as the signature of William Moorcroft, painted in green. These pieces occasionally have a pattern registration number. The mark on pottery made between 1904 and 1913 is similar, but with William Moorcroft's initials rather than a full signature tending to be more common. Between the years of 1904 and 1913, pottery was stamped with a Macintyre and Co., Burslem brown mark. Pottery made between 1928 and 1949 has the full signature of William Moorcroft, a Burslem stamp and a Made in England stamp changed as William Moorcroft moved from Macintyre & Co, at the start of the 20th Century, and set up his own factory in 1914. When Walter Moorcroft took over from his father he too had his own marks. Occasionally, all marks can be hard to decipher. In the 1990’s designers outside the Moorcroft family began working for Moorcroft, from Sally Dennis and Philip Richardson to Rachel Bishop, who became Moorcroft’s senior designer in 1993, and the birth of the Moorcroft Design Studio in 1998. Please send images of the base of your signature to enquiries@moorcroft.com should you wish to pay for formal identifications. This service is free to members of the Moorcroft Club but costs members of the public £25. Club members should contact mclub@moorcroft.com Alternatively, early Moorcroft signatures and marks can be found in Moorcroft: A Guide to Moorcroft Pottery 1897-1993 Hardcover – 27 May 2008 by Paul Atterbury. 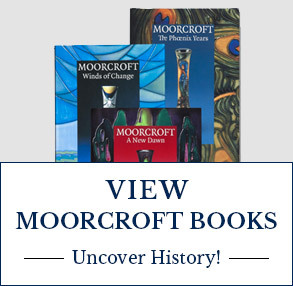 Should you require further information on Moorcroft generally, we do have 4 books available on Moorcroft; Moorcroft: The Phoenix Years, Moorcroft: Winds of Change and Moorcroft: A New Dawn, all written by Fraser Street and Moorcroft 1897 - 1993, written by Paul Atterbury. Every piece of Moorcroft has marks on the base which will tell a story. They identify the fact that it was made in England, who designed the particular piece, the year the piece was made, the year of the design and who painted and tubelined the particular piece. Initials which are painted onto the base of your piece of Moorcroft marks the painter’s name and the initial that appears to be stamped into the clay body is the initial of the tubeliner in question. Painters and Tubeliners initials have been marked since the 1990’s and allow avid Moorcroft enthusiasts to track those pieces that have been made by their favoured tubeliner or artist. There are many such marks. If you are a member of the Moorcroft Club we will identify these for you free of charge mclub@moorcroft.com Alternatively, members of the public may wish to use our identification service for a £25 fee enquiries@moorcroft.com Should you wish to find further information on decorators marks, we do have 4 books available on Moorcroft; Moorcroft: The Phoenix Years, Moorcroft: Winds of Change and Moorcroft: A New Dawn, all written by Fraser Street and Moorcroft 1897 - 1993, written by Paul Atterbury. My vase has a label stating 'Potter to HM The Queen'. Which Queen is this? The first examples of the Royal Warrant paper label – ‘Potter To HM The Queen’ can be found from 1928 onwards. The label was updated in 1936 to read ‘Potter To HM Queen Mary’, following the death of King George V.
Moorcroft Royal Warrant Paper label transferred to Walter Moorcroft in 1946 and stating ‘By Appoinment Potters To The Late Queen Mary’. What are the Moorcroft Year Cyphers? Moorcroft introduced year cyphers in 1990 and are symbols used to identify the year each piece was made. Copyright marks merely state the date when the design was first used. Some designs, like Queen’s Choice by Emma Bossons FRSA, have proved popular for almost 20 years with copyright stated as 2000. Consequently, it was felt prudent to use symbols to mark each year. Sometimes Moorcroft Club members have even designed these! For those whom are not members of the Moorcroft Club, we do charge a fee of £25 per item identified (with regard to shape, surface design, name of designer and year of copyright, whether or not the piece is a special, limited or catalogue edition) in order to cover our administrative costs. This is a free service to Moorcroft Club members. Can you value my piece of Moorcroft? Sadly, we are unable to value the piece for you, but I recommend that you contact a reputable auction house. A good auction house should be able to advise you of the value of your piece of Moorcroft pottery. Better still, an auction house that specialises in Twentieth Century Decorative Art sales would be the most qualified for ceramic valuations. We recommend that the appraiser you appoint is accredited, knowledgeable in Twentieth Century Decorative Art, and has an independent relationship from both the buyer and seller. For a more accurate appraisal, we gently suggest that you bring your piece to the appraiser in person. Estimates from photographs and descriptions (whether on-line or not) may not disclose whether or not a piece has been crazed, cracked, restored or subject to other imperfections that cannot be identified unless the piece is thoroughly inspected by expert hands and eyes. We give the same advice to any would-be buyers of Moorcroft. 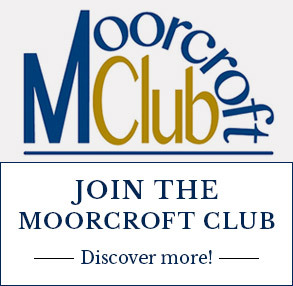 How can I join the Moorcroft Club and what are the benefits? The Moorcroft club is truly a place of fun and camaraderie, where Moorcroft fans worldwide come together to share their passion for Moorcroft - and to find those all-important collectable pieces at some of our exclusive club events! Visit the Members page to discover the many benefits of joining the Club and an on-line membership application form. I have the word ‘TRIAL’ marked on the base of my piece. What does this mean? All pieces of Moorcroft are now marked with upper case MOORCROFT and Stoke-On-Trent above ENGLAND. Each Moorcroft design starts life as a trial. Sometimes a designer may trial a vase for many years with a huge number of trials made until their vision is obtained in ceramic form and past as an official Moorcroft design following a yearly design selection meeting or through a private decision of Moorcroft’s Art Director, Elise Adams, if made for a specific purpose which cannot wait until the annual design meeting. Even here, at least one other senior member of staff will be present, but never the designer.The trial date marks the date which that particular trial was painted. Some Moorcroft Club members solely collect trials and others may by them because they prefer the colourway or surface design to the final design chosen. We all have different tastes after all. The trial date, copyright and WM are usually marked in brown, green or blue. Where do I find a comprehensive list of old designs? To find current pieces of Moorcroft please use the search facilities on this website. A comprehensive list of discontinued designs does not exist – there are many designs in Moorcroft’s illustrious history. Some, but not all, discontinued designs can be identified in either old copies of your Moorcroft Club Journals (previously named, Club Newsletters) for those who are Moorcroft Club members or within 4 books available on Moorcroft, Moorcroft: The Phoenix Years, Moorcroft: Winds of Change, Moorcroft: A New Dawn, all written by Fraser Street and Moorcroft 1897 - 1993, written by Paul Atterbury. Can I buy just a gift box? Gift boxes are only available with sales of best quality pieces. You cannot buy a Moorcroft gift box unless it is for a heavily discounted best quality piece in a sale, where a giftbox would not normally be supplied. Gift cards can be purchased at the Moorcroft Heritage Visitor Centre, Sandbach Rd, Burslem, Stoke-on-Trent, ST6 2DQ. My Moorcroft lamp shade is damaged, can I replace it? My piece of Moorcroft has a number of hairline marks on it – what is this please? These tiny hairline cracks are called crazing and they are not really cracks at all. Crazing is a natural ageing process in ceramics. A fired porous earthenware body such as the one used by Moorcroft can, under conditions of normal use, absorb moisture from the surrounding environment and over a period of time will result in crazing of the glaze surface. In any saleroom of antiques, part of the process of establishing the correct vintage of a pot is to examine the crazing on the surface. It also helps identify restoration since crazed areas cannot be restored without harming the crazing. Neither can restored areas be artificially re-crazed. Conversely, an old pot, which has been refired, may well have its pedigree challenged due to the absence of familiar and friendly crazing. Put another way, age crazing is a friend, not an enemy. Usually, crazing tends to start when a piece of pottery is over a decade old, and which generally comes to an end after as many as 70 years. Occasionally it can start earlier depending on the type of clay body Moorcroft designers choose to use. For example, the white body has been known to craze a little earlier if there are adverse environmental conditions, whereas the celadon body crazes much later Moorcroft is made from a porous earthenware pottery, and crazing is just part of the normal process of aging of this material. We advise collectors to display pieces in a dry environment and ideally at a constant temperature. There is no British Standard specification for craze resistance on earthenware products, but Moorcroft does, on an annual basis, submit samples of its product to an independent laboratory for craze resistance testing. It is worth noting that to date, all samples submitted by Moorcroft have actually exceeded the expected level of craze resistance. Once collectors know more about the natural crazing process, they more often than not do not wish to have a piece re-fired. However, if you do wish to have your piece re-glazed and re-fired then do write confirming this wish. We will then send you the relevant paperwork to complete but refiring will be entirely at your own risk. Contact enquiries@moorcroft.com in this respect. Is there anything I can do to stop my vase crazing? We advise collectors to display their pieces of Moorcroft in a dry environment and, ideally, at a constant temperature. As earthenware pottery is semi-porous it can absorb moisture. Some people use their Moorcroft to hold flowers. Whilst we believe that you should use your Moorcroft to enhance your life in any way you feel free, holding water in an earthenware vessel for prolonged period of time may trigger premature crazing. Can I see Moorcroft being made? Television celebrity and antiques expert, Eric Knowles, is a non-executive director of W Moorcroft Ltd. A few years ago he created a video documenting how Moorcroft is made. This can be purchased for £5 from the Moorcroft Heritage Visitor Centre. 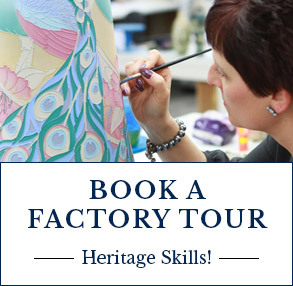 If you have a free morning or afternoon, we strongly recommended a factory tour at the Moorcroft Heritage Visitor Centre and Museum. Our guided tour takes visitors into the heart of the Moorcroft Factory. Comprehensive information is given by expert tour guides on all aspects of the hand-made processes of mould making, slip casting, hand turning, tube lining, hand painting, kiln firing and finally glazing. The techniques used in Moorcroft pottery are virtually the same today, as they were a hundred years ago. Visitors enter a time warp from which they can look into the virtual soul of what must be the world's best loved art pottery. Advance booking is necessary of at least 2 weeks prior to visiting the pottery. Tours take place each day between Monday and Friday at either 11am or 2pm. There is a vending machine available onsite for hot drinks. Factory tours last approx 1 hour. Pre-booking is essential, please call in advance to book 01782 820515. Opening times may vary on Bank Holidays, please ring to confirm times. My Moorcroft clock face is broken – can I replace it? In the first instance go on line and check the shipping status on the courier's website. If the information is inconclusive, please email myorder@moorcroft.com and we will investigate further and report our findings to you. In most instances our courier, FedEx, will send an automated email to advise that your order has been collected from our factory, and is on its way. Can you give me an exact delivery time or date? Orders to the UK are general dispatched on a 48hr service. If a timed service or a Saturday delivery is required, please email myorder@moorcroft.com and we will try and accomodate your request. Additional charges may be applicable. It is not possible for us to give an exact delivery date on overseas orders. Please check the on line shipping status once the shipment has been dispatched. Can I return an item purchased on the Outlet page? If I'm purchasing from outside of the UK are my purchases excmpt from VAT? If your purchases are being shipped to an address outside of the UK, then no VAT will be charged on your order. You will not be eligible for tax free shopping if you order on line and then collect from the factory. Can my table lamp be wired for use overseas? We are able to wire table lamps for use in Australia and New Zealand. We are not currently able to wire table lamps for use in other overseas countries. Please email enquiries@moorcroft.com to enquiry about a specific requirement and we will advise on availability and costs.